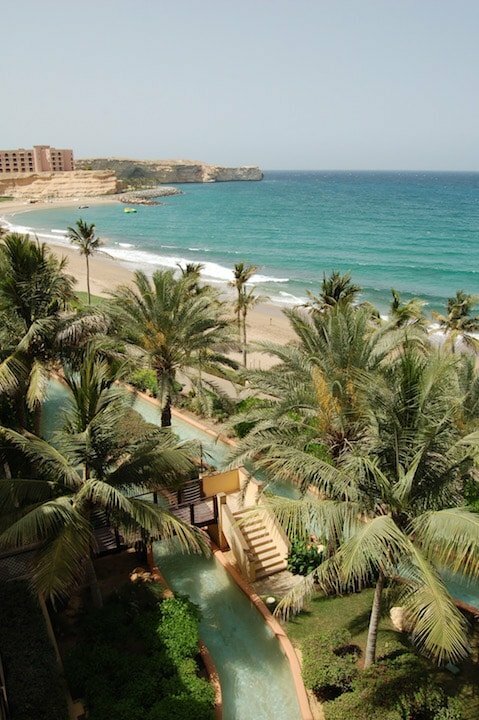 We’ve been to Oman a few times now, and we’d actually visited the Shangri-La Muscat once before not long after it opened, back in the summer of 2007 when we lived in Dubai, and long before I’d started Arabian Notes so I was interested to go back and see what had changed. The ocean is just so clear blue, and the mountains are amazing, they’re so clean and perfectly shaped that they almost look like they’re fake (but they’re definitely not!). 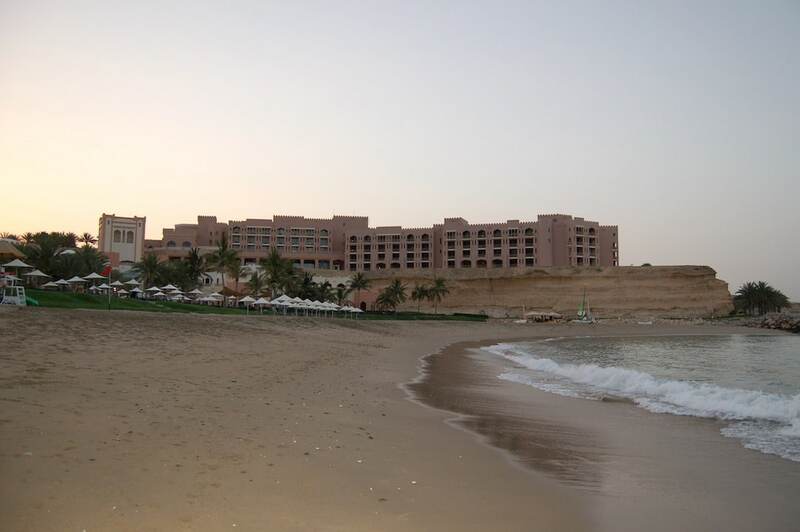 The resort is made up of three hotels – Al Waha (The Oasis) for families, Al Bandar (The Town) in the centre of the resort and Al Husn (The Castle) set high up on the cliffs above the bay aimed at luxury and serenity seeking adults. We had previously stayed at Al Bandar and this time since we have Baby now, we stayed at Al Waha. 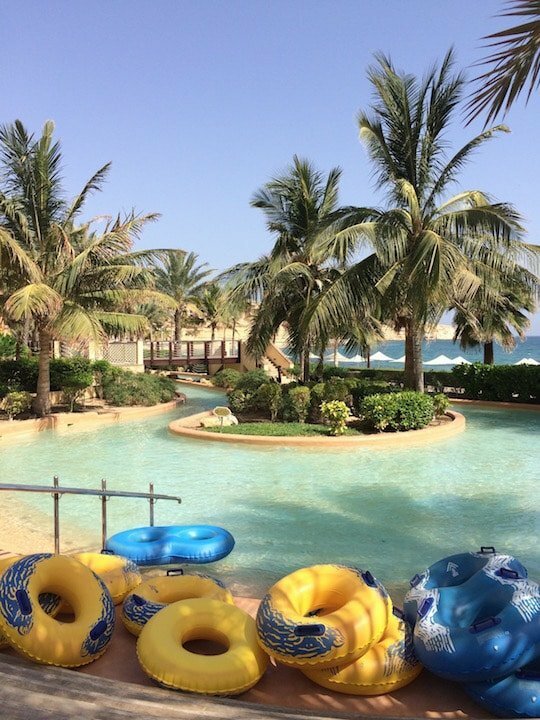 Al Waha is pretty well-known for having heaps of activities to keep families and kids occupied throughout the year, and one of the best – the lazy river, ran right along the resort next to the beach under our window (cue childlike whooping with excitement!)! 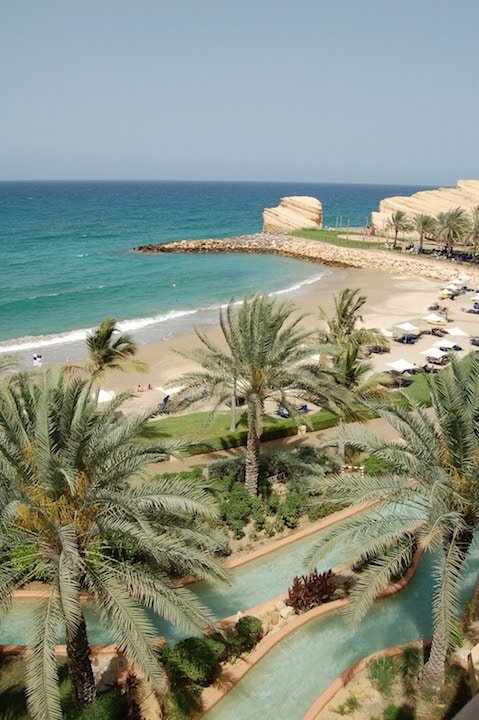 The view from Al Waha of the beach and lazy river (Al Husn in distance at the top of the rocks). 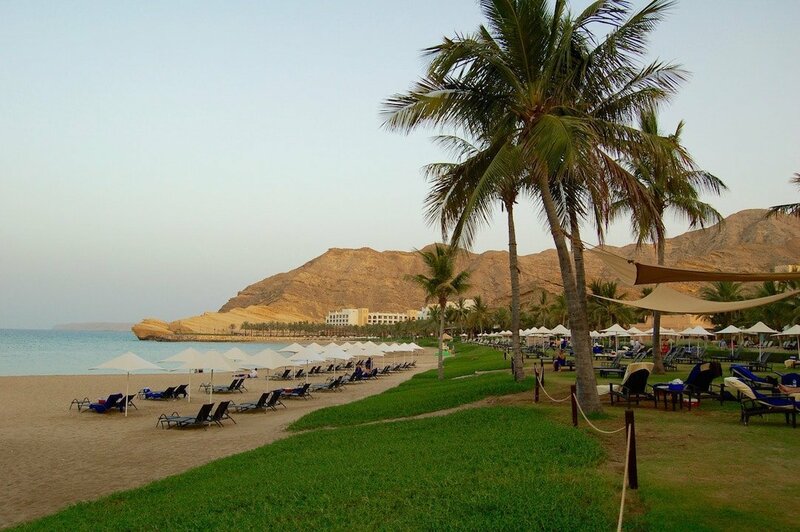 The hotel is just set in such beautiful surroundings, right on the beach nestled between the mountains, and aside from the aesthetic appeal of it all, the mountains just also provide a real feeling of privacy and calm. From whichever hotel in the resort you choose to stay at, the views are just gorgeous! View from Al Husn of the whole resort, with Al Waha at the far end on the right. 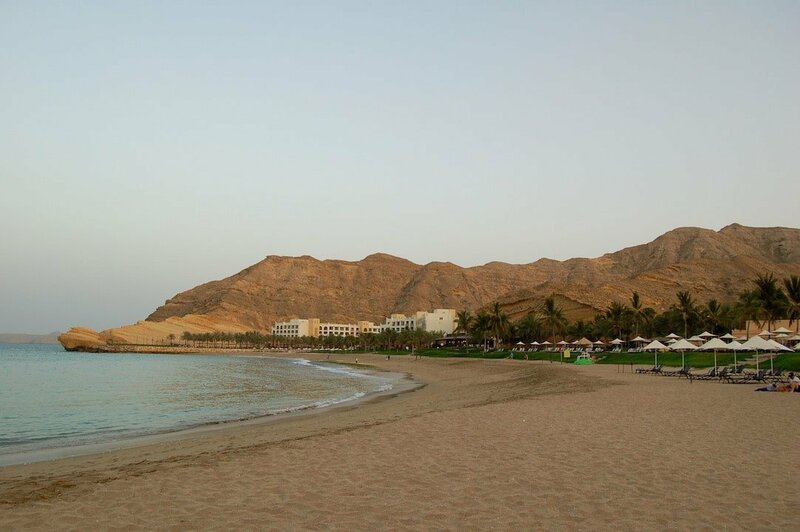 The beach is long and wide so there’s plenty of space for everyone to relax and enjoy (though even with the hotel relatively busy it never looked crowded), and if you’re staying at Al Husn you even get your very own private beach exclusive to that hotel! It’s worth noting that if peace and quiet without kids is what you’re after then Al Husn could well be the place for you – of course they have their own separate pool as well as the beach, and guests of Al Husn can visit any of the other hotels and make use of those facilities if they choose, but guests of the other hotels can’t make use of the Al Husn pool or beach, so as well as exclusivity (woooooo! ), you are assured privacy and quiet! 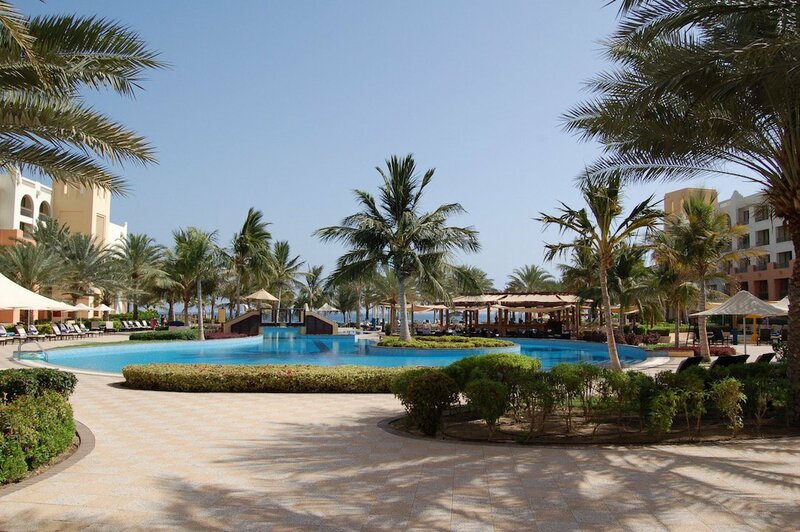 Al Waha has a large family pool as well as a shallower kids pool and another kids play pool with mushroom fountain in the centre – and both of the kids pools are covered by shades to help keep the little ones sun safe. I just can’t get over those mountains! It’s so lovely sitting by the pool with the beach and calm of the ocean in one direction and those majestic mountains in the other! 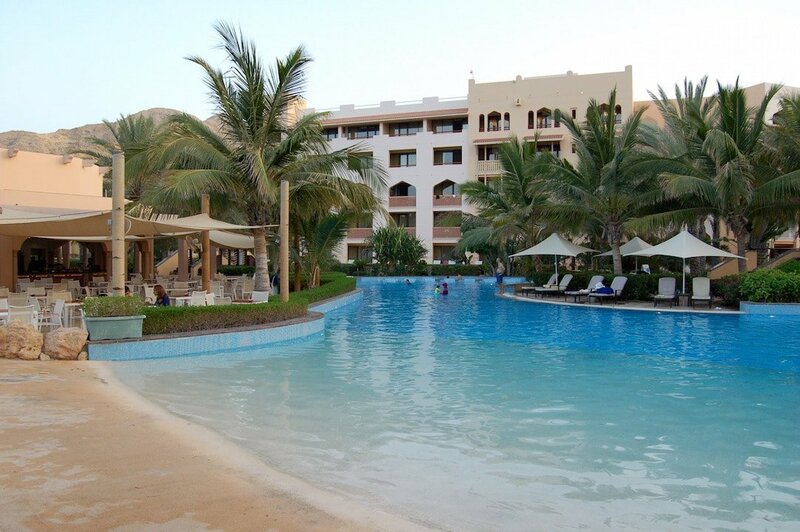 Right in the centre of the resort is the Al Bandar hotel which of course also has its own pool and pool side café too. 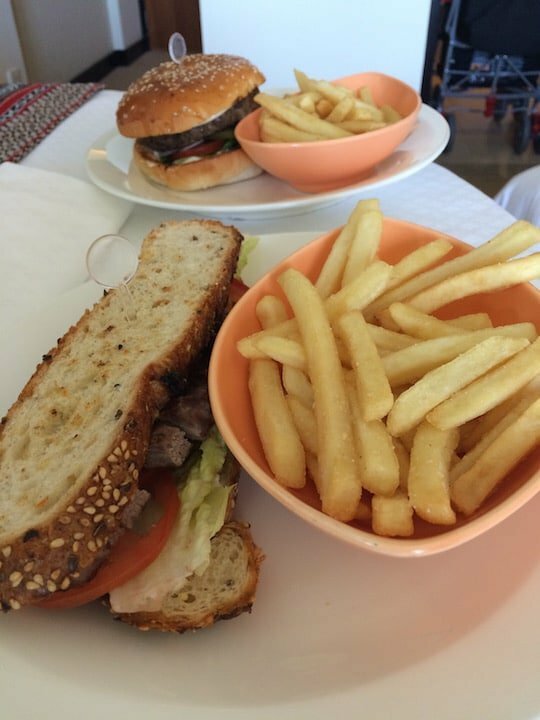 If room service is not for you, there are heaps of other dining choices throughout the resort – I think there are 22 restaurants in total so you can be sure you’ll never go hungry and you’ll certainly never get bored! In fact, you don’t even need to leave the resort at all if you don’t want to – there’s even a heritage village and souk for a spot of shopping and a couple more food outlets. Make sure you pass by and say hello to this chap below – traditional basket weaver extraordinaire! The next night after a tough morning in the rather fabulous spa (the treatment rooms are amazing private villas) followed by some equally taxing swimming and relaxing (!) we chose to venture out and eat at Capri Court, an Italian restaurant located next to the beach over at the Al Bandar hotel. We kept the baby in his normal routine and put him to bed at around 7pm, but instead putting him down to sleep in his pushchair so he could come with us as we had dinner. We just pulled the hood on the pushchair down and covered it over with a swaddle to block out any stimulation and off we went. The setting for the restaurant was very romantic, and the position allowed the breeze to come through off the water so it wasn’t too hot – in fact it was just perfect sitting outside there, it was a lovely way to spend a relaxed evening with good food and company. And aside from a brief interruption for a necessary nappy change, Baby Arabian Notes slept soundly the whole time. 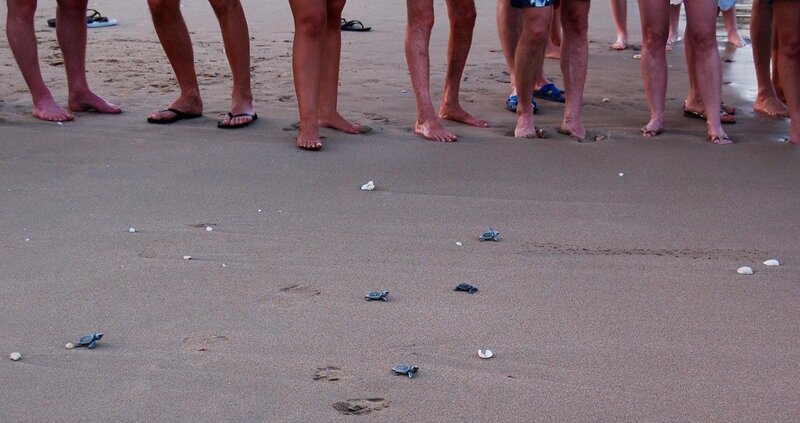 While we were at the hotel we were also incredibly lucky to get to see newly hatched turtles make their way from one of the nests on the beach back into the sea. The resort even has its own turtle rangers that care for the welfare of their resident turtles and ensures the nests are protected and left well alone. Of course during this event the turtle rangers were on hand to make sure the guests were kept at a safe distance to allow the turtles safe passage. I mentioned before that there was loads to do to keep kids occupied – of course they have a kids club with loads of activities scheduled on different days and times, but in actual fact they have two! One for younger kids from age four and another one for the older kids up to age 17. As well as all the pools to choose from too, there’s also a big separate water play area called splashpad. 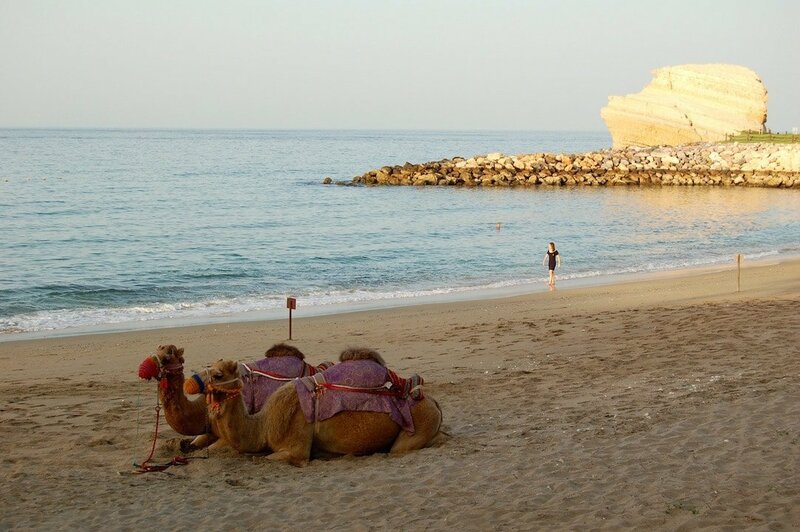 And of course what self-respecting Arabian resort doesn’t offer camel rides?! 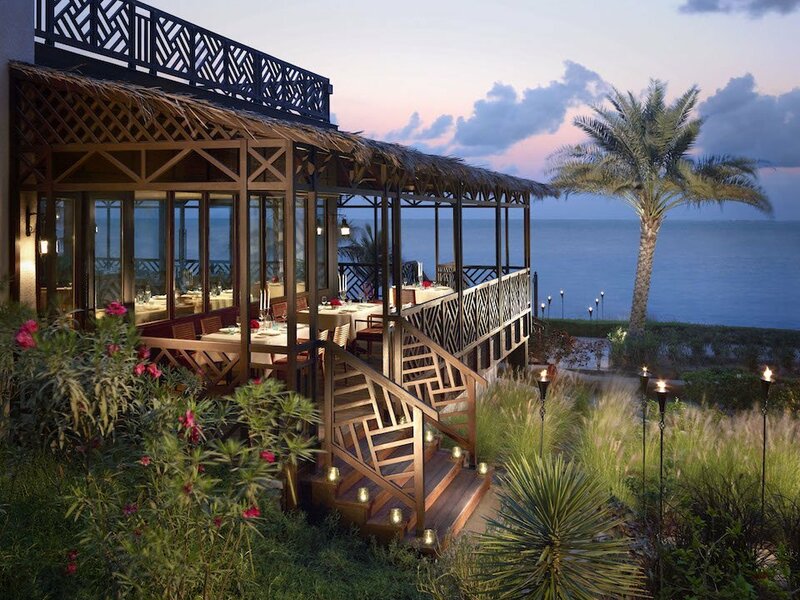 As we’d been wandering around the resort during the day I’d been eyeing up a rather lovely looking place – the Bait Al Bahr seafood restaurant and we decided we couldn’t leave without eating there too, it just looked so exotic and enticing. 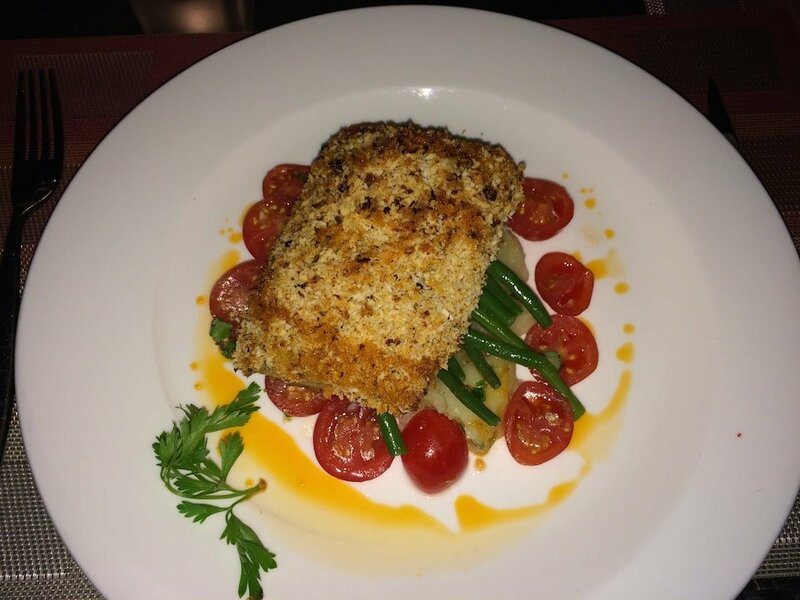 And I was glad we did – as well as another exquisite setting, the food was sophisticated yet refreshingly uncomplicated, fresh (with much of it caught locally from the fishermen in the settlement at the next cove along from the resort), well presented and very tasty. 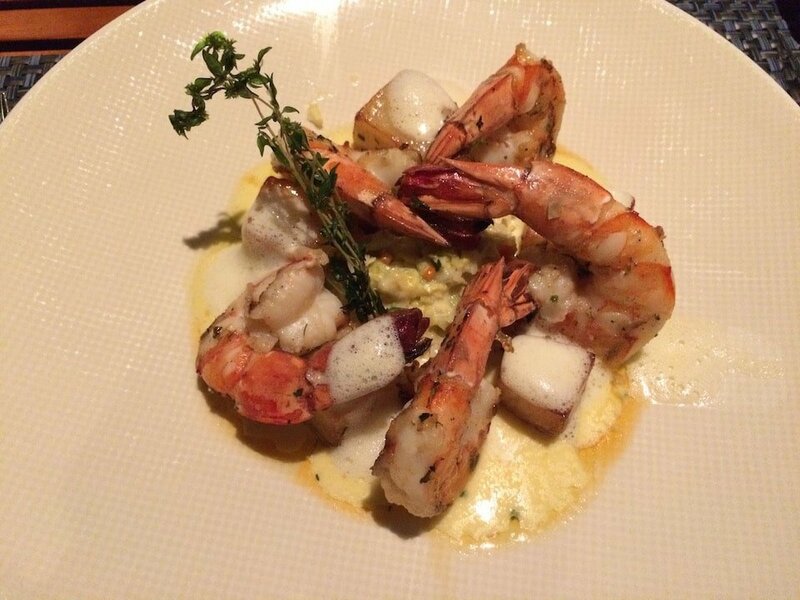 I’d put Bait Al Bahr down as a ‘not to be missed’, and that’s coming from me – I’m not normally a big seafood lover! 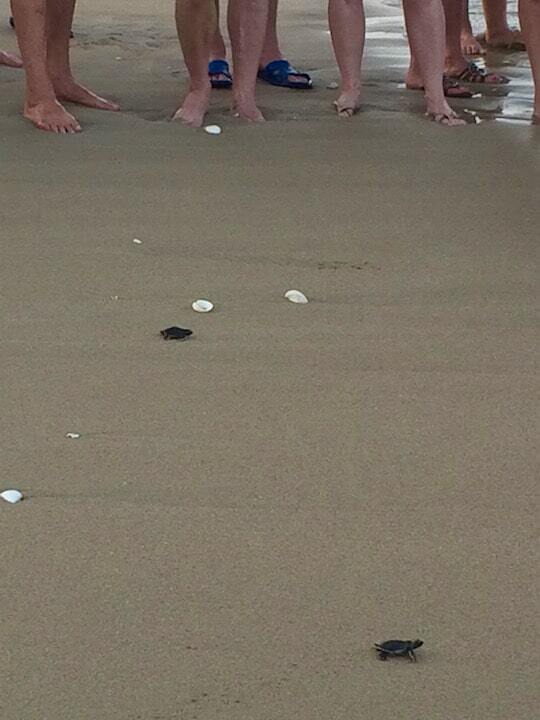 All in all it was a great getaway and a very successful first holiday for us as a family. If you haven’t been, you most definitely should – and if you enter my competition below, one of you lucky people can win a one night stay at the hotel! 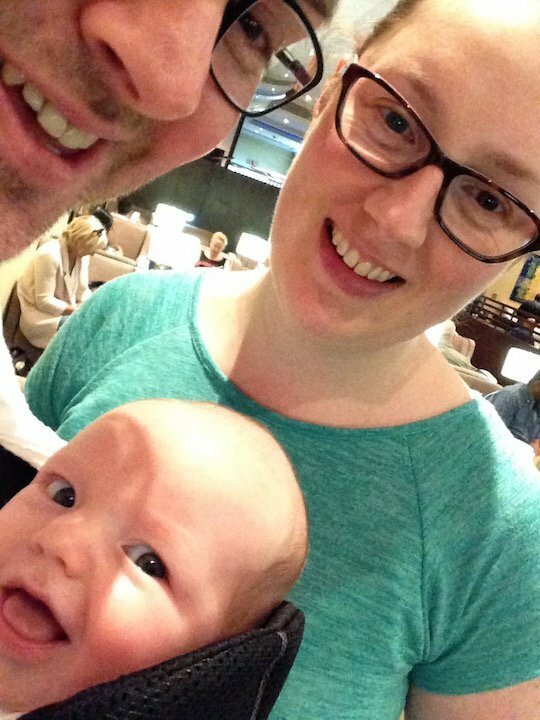 Family selfie fun at the airport on our way home! Find out more about the resort on their website by clicking here. 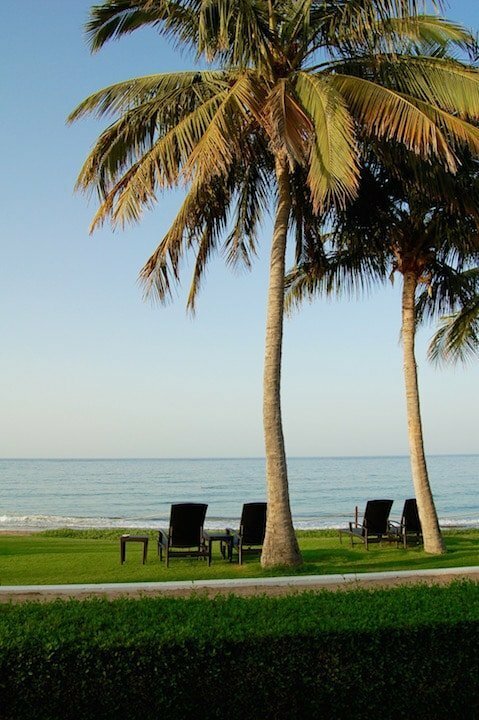 T’s & C’s: One night stay at the Shangri-La Barr Al Jissah is for maximum two adults and two kids below 12 years of age, staying in an Al Waha Superior Room, with breakfast included. Prize valid for stays until September 30th 2015. Competition closes on May 20th, 2015, winner will be contacted and announced on Facebook. 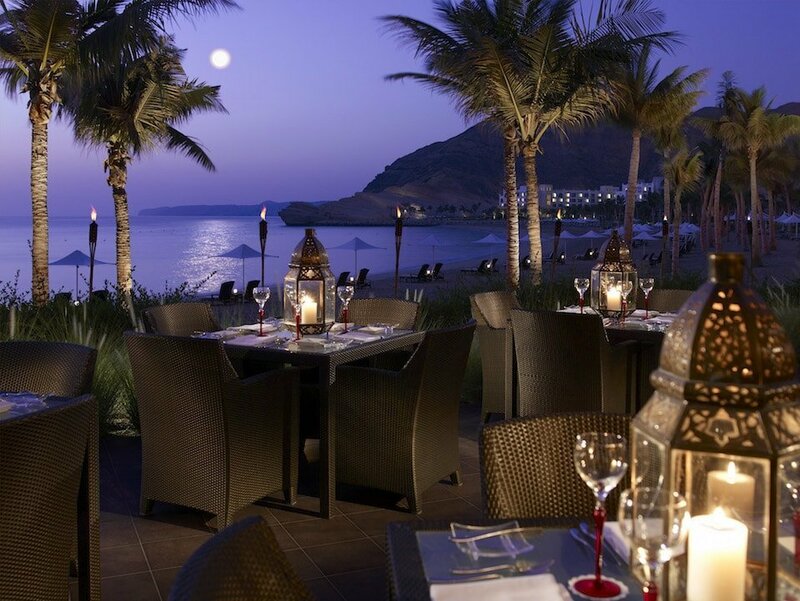 I would love to visit Shangri-La Barr Al, it looks amazing. 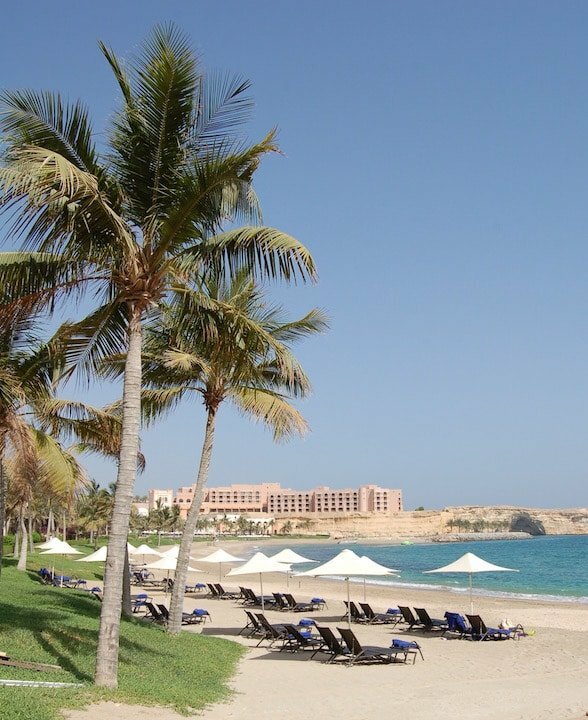 I am visiting Oman the month of July-August. What can I do to spend a night there? please let me know. It would be a dream come true. 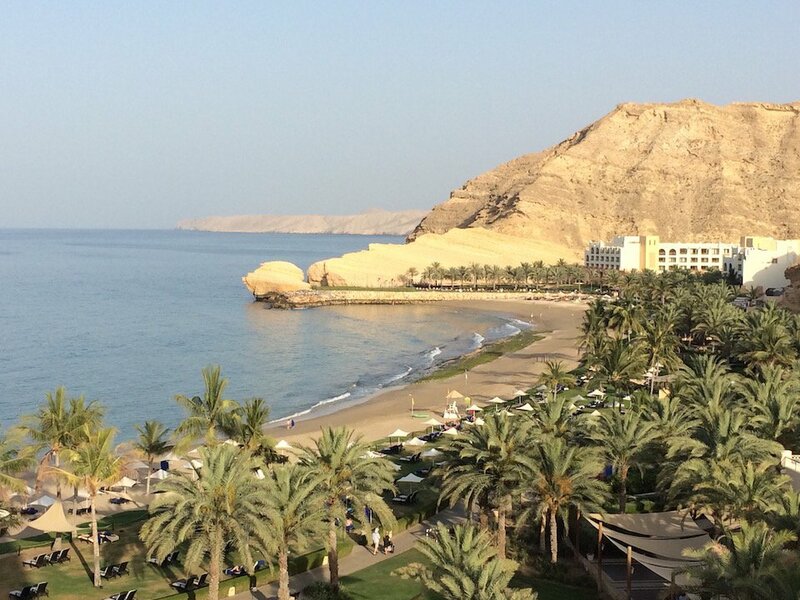 Awesome review.Thank you for sharing.Muscat is truly a fantastic historical and cultural hidden Gem of the Arab world.